Home » Results » Nashua Invitational Recap, Results, Pics! Updated with Races and Interviews! Nashua Invitational Recap, Results, Pics! Updated with Races and Interviews! Interviews and Race Videos coming soon! On a typical mid-September day, with a lack of wind, an overcast sky and tolerable humidity made for optimal running conditions over the famed Mine Falls course. Of the eleven cross country teams gathered to compete at the 2018 Nashua North Invitational, seven were from Division 1. 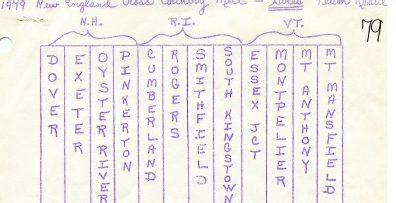 Groton-Dunstable of Massachusetts was the lone team from out of state this year. The girl’s race featured the 2017 New England Cross Country Champion Julia Robitaille of Manchester West and Nashua South’s Cali Coffin. Coffin to her credit, has a 4th place finish of her own in the 3200 meters in the New England Championships last spring as a freshman. Right from the start, the defending champion and Nashua North Invitational Record Holder Robitaille grinded to the lead and was working really hard as always to shake Coffin at the first turn, but managed only a 10 meter lead at most. By the time they completed the first mile, Coffin had already turned the tables on her and built up a solid 30 meter lead of her own; a lead would only grow larger. At the two mile mark the race was out of reach for even Robitaille and it looked as if she took her foot off the pedal, perhaps to save the energy for the next battle. Coffin looking like she had something to prove kept on hammering to the finish to an impressive time of 17:21 in a new Nashua North Invitational Record. Coffin had a monstrous 2:06 minute improvement from last year’s race. Running like a stolen Maserati, Coffin looks like the fastest thing to come down the Everett Turnpike in a while. She became the third fastest girl ever to run this course and her time is the fourth best ever. Only Jacqueline Gaughan (twice) and Julia Robittaile have run faster but no one has gone this fast as a sophomore. As for last year’s NH Runner of the Year Julia Robitaille, she finished second in 18:18 in the exact time she finished last year for the invitational record. To complete the sister act 2017 All New England Corinne Robitaille finished up really strong placing 3rd in 18:28. Bishop Guertin Caroline Towle ran solid placing 4th in 18:41 and Nashua North’s Arianna Braccio was the last to go under 19 minutes in 5th 18:57. Groton-Dunstable took the next two places with Sarah Maple 6th in 19:06 and Sydney Adams 7th in 19:13. Merrimack’s Adele Alexander 8th in 19:23, Concord’s Morgane Orcutt 9th in 19:37, a pair of freshman from Salem finished up next with Bethany Graham in 10th in 19:39 and Natalie Coryea 11th in 19:44. Running 19:48 in 12th place was Merrimack’s Lauren Brennan a mere half second ahead of Nashua South’s Lydia Hudson 13th in 19:48. Emma Gannon of Salem 14th in 20:01 and Kimmie Harding of Groton-Dunstable ran 20:05 to round out the top 15. The Salem Blue Devil youth movement is sure to be on the rise and in the discussion in the next NHCC rankings. Previously unranked Salem won rather easily placing five underclassmen, three of which are freshman, in the top 23 to score 62 points. Groton-Dunstable was 2nd with 80 points, while Concord is on the rise also, placing 3rd in 89 points ahead of Bishop Guertin who placed 4th with 109 points. Merrimack edged Nashua South by way of the 6th man tie breaker as both teams had 139 points. Winners of the last two Nashua North Invitationals, the Concord boys were eager to come to the Gate City to see if they could rewrite the record books and make it three in a row. Individually recent Nashua North graduate David Vorbach, who now runs for Columbia University, had a stranglehold by winning the last two individual crowns. In 2017, Vorbach’s limits were always tested by Concord’s Forest MacKenzie will to win. This fueled fierce competition and epic battles that were legendary. Now over it made each runner stronger moving on. After finishing second in this race last year and Vorbach’s departure of the throne, MacKenzie let go of revenge and took steady aim at breaking the existing Invitational record of 15:43 held by fellow Concord alumni BJ Smith back in 2012. This year however MacKenzie has a proven wingman to go into battle with; a teammate with steady composure in Eli Boesch-Dining. By placing 2nd in the 2017 Division 1 Championships, Boesch-Dining’s burning drive and desire only fuels his determination for conquest. These two have formed arguably the best one-two punch in New England along with a full stable of Stallions chomping at the bit! As predicted in the preview MacKenzie and Boesch-Dining took control of the race with a chase pack in tow at the first turn. It seemed like many of the contenders were concentrating on matching the moves of Pinkerton’s Joe Gagnon. Gagnon is the one guy that more than often seems to make his way near MacKenzie’s back pocket. Gagnon held back for much of the first lap but by the time he had entered the woods he, along with North’s Joseph Curran and Salem’s Sean Holden ,was in command of the chase pack. But by this time the race for the top two places was pretty much in hand for the Concord duo running side by side. As they came out of the woods the pair had built up a lead the size of a football field including the end zones. At 1000 meters to go and with a sure Concord two man sweep in hand, MacKenzie determined to break the record started pressing the pace. A slight separation between the pair developed. As they approached the final straight away, it was clear both runners had a decent shot at the record. With two powerful finishing kicks on display MacKenzie finished first in a new record time of 15:35, and Boesch-Dining second also under the record in a blazing 15:41. The remainder of the top 10 continued with Pinkerton’s Gagnon (3rd,16:01), Nashua North’s Curran (4th 16:07), Concord’s Eben Bragg (5th 16:14), Salem’s Holden (6th 16:16), Concord’s Aiden O’Hern (7th 16:17), Londonderry’s Matt Griffin (8th 16:18), Concord’s Dave Cook (9th 16:22) and Nashua North’s Gediyon Prince was 10th in 16:23. The rest of the top 15 included Brayden Kearns of Concord (11th 16:29), Londonderry’s Eric Nowak (12th 16:31), Concord’s Ryan Ciesluk (13th 16:34), Hollis/Brookline’s Kenny Corsetti (14th 16:35) and Concord’s Ryan Devine (15th 16:36). By spreading eight runners throughout the top 15, Concord flexed its strength by scoring 24 points. Londonderry showed its depth despite running without Will Heenan and Ryan Young to place 2nd with 72 points. Pinkerton led by Gagnon and the top freshman on the day Luke Brennan (17th 16:39) placed 3rd with 96 points, as Nashua North was 4th with 118 points with Salem posting a 5th with 146 points. Concord’s team average of 16:02 broke the record of 16:32 set by Pinkerton in 2015. In the girls middle school race Amherst’s Masho Primmer placed first overall in a time of 13:45, just nipping her own teammate Stephanie Svendsen (13:46). Deerfield’s Sophie Hopkins was 3rd in 13:51. 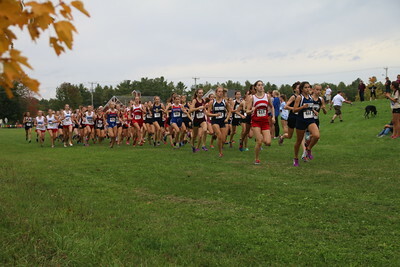 Ten teams competed on the 2 mile course with Defending Division II State Champions Amherst girls winning the team competition with 38 points, 2017 Division III Champion Deerfield was second with 50 points, Fairgrounds was 3rd (90 points), Elm St. was 4th with 100 points and Presentation of Mary was 5th with 133 points. After finishing second last year, Kariso Anderson of Amherst easily took the win by running 12:03 in a new Middle School Invitational Record formerly held by Deerfield’s John Murphy. He was followed by Nashua Catholic’s Bobby Canaway 2nd 12:28 and Elm Street’s Jesse Bordelon 3rd 12:46. Amherst completed the team sweep by scoring 54 points to upend the 2017 Division III Champion Deerfield (62 points), Fairgrounds was 3rd with 68 points, Nashua Catholic placed 4th with 108 points and Presentation of Mary was 5th with 133 points. Truly amazing races by Cali Coffin (I apologize for calling you Cali Cofrin! ), Forest and Eli, the Concord boys and especially the Salem girls. I was glad to be able to run video and interviews for the race as see such great performances. Best of luck to our winners the rest of the way! Next post Pics & Quote #5: Competitors!